Different colours trigger different moods, thus carry different meanings. From improving efficiency to exuding a calming sense of tranquillity, find out what each colour means and how to incorporate them into your living space to achieve the particular mood & feel you desire. This lively but uncommon colour allows you to express yourself with confidence. 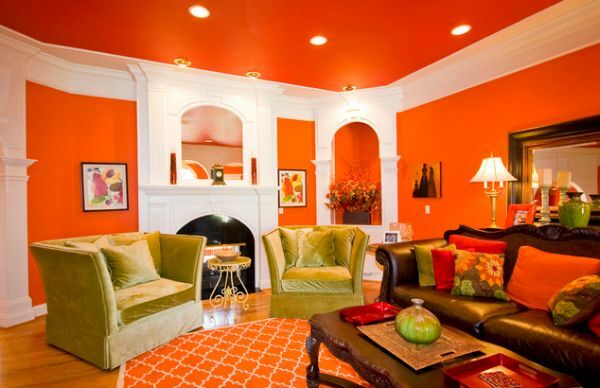 Add a splash of orange in your home to feel younger immediately. It is also the colour of laughter and celebration, a good choice for a child’s bedroom or play space. This particular shade of blue exudes a cool & focused energy, purifying your thoughts, helping you to cut through the clutter. It also helps you pay attention to the finer details. Ideal for your study or home library to promote efficiency & productivity. The colour of the ocean & the sky, blue promotes relaxation and can help reduce feelings of depression & anxiety. Try a light blue headboard or painted ceiling to bring ease into the home and calm the mind every time you step into your bedroom. Contrary to popular belief, pink is not exclusively associated with all things girly. It might not even be your first (or 10th) choice when selecting the theme of your living or dining room. However, play around with its different hues to bring out a sense of sweetness, boldness, playfulness or even sophistication. All you need to do is use your imagination. In conclusion, colours can have a tremendous effect on our mood & wellbeing, so be smart about your choices & the desired effect you wish to bring out in a particular room.